New York’s Times Square is not the only place to countdown the end of 2014 and welcome the New Year! New York’s Times Square is not the only place to countdown the end of 2014 and welcome the New Year! Avventure Bellissime can help you plan a trip to Italy to celebrate 2015 with gusto. 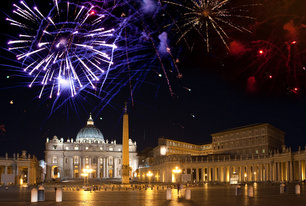 All countries have distinctive traditions to mark the passage of one year to the next and Italy is no exception. What celebration or vacation experiences in Italy would be complete without great food? Large meals are part of the festivities for friends and families on New Year’s Eve, featuring foods like lentils, large sausages, or stuffed trotters (pig feet) to symbolize good fortune in the year ahead. To toast a prosperous new year most glasses raised will be filled with sparkling Italian wine like spumante or prosecco. In some places in Canada, the US, and the United Kingdom people bang pots and pans at midnight to welcome the new year. An old tradition, mostly in the southern parts of Italy, is to toss old kitchenware outside to bid farewell to the old as you welcome the new. If you stay along the coastline you can expect to hear ships sounding their horns at midnight, the same as they do in ports in North America and elsewhere in Europe. In Italy, where we’re known for our fashion, anyone of any age or appearance who hopes for a great year ahead has a simple task to encourage luck: Wear red underwear on New Year’s Eve. Red underpants have been considered lucky and protective against malicious forces since medieval times. So now you know the most important wardrobe choice to pack for your Italy vacation for New Year’s Eve! How you celebrate New Year’s Eve in Italy is up to you. You can plan an Italy vacation that is festive with rock bands and dancing, traditional and family friendly, or romantic and quiet. 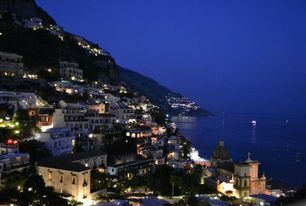 Naples tours this time of year will take you to the area renowned for massive fireworks displays. Other cities in Italy will have fireworks and smaller towns will host gatherings around bonfires in central squares, but Naples is the destination with the significant pyrotechnic displays and outdoor concerts with headline entertainers playing rock, folk, and classical music. If you book Rome Tours for New Year’s there are a few choices for huge celebrations, with live music and dancing at piazzas (squares) all over the city. Massive crowds gather at the Piazza del Popolo for outdoor music and fireworks. Another one of the biggest parties is near the Colosseum on Via dei Fori Imperiali with dancing, live music, midnight fireworks, and merrymaking lasting well into the wee hours. Food is central to the celebrations you’ll encounter if you opt for Bologna Tours. While it’s true that every region of Italy is known for culinary delights, Bologna is the city Italians think of when it comes to cuisine and gastronomic achievements. So in the city of food markets and fine food establishments, New Year’s Eve features delightful meals in local eateries as well as a long-held tradition of holding a lottery to win a specially decorated fine fat ox called the Fiera del Bue Grasso. The Piazzas are lively with music, bonfires, street market vendors, and performers. Midnight is marked with the ringing of church bells, fireworks, and the lottery for the ox. If you are looking for a romantic New Year’s destination, Venice Tours may be perfect for you and your sweetheart. The tradition in this ancient city with its stunning architecture and intricate network of canals is to go out for dinner at a restaurant on New Year’s Eve. Remember that Italians eat dinner later, and the festive feasts on this special day usually start around 9 p.m. and end welcoming the new year at midnight. St. Mark’s Square is where the community party is held, complete with live music and impressive fireworks. When the countdown is over the crowd celebrates with a toast and lots of kissing. The tour specialists at Avventure Bellissime team have more suggestions for New Year’s vacation packages or tours and other exciting Italy excursions.Contact the Avventure Bellissime team for help planning your trip to Italy.